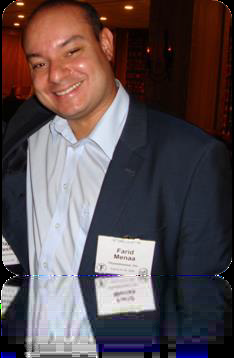 Dr. Farid Menaa, is a French citizen, proficient in various languages (fluency in French, English, Portuguese; acceptable knowledge in Spanish, German and Arabic) and has lived in four countries within two continents. Dr. Menaa is an experienced and skilled inter- and multi-disciplinary professional. Dr. Menaa earned his degrees mainly from France (Paris) with high distinctions from prestigious universities and institutions. He holds a Bsc. Eng. Bio, Bsc. Physiology and Cell Biology, Msc. Genetics/Molecular and Cell Biology, Msc Gerontology/Genetics, PhD Gerontology/Genetics/Radiation Oncology, EMBA Entrepreneurship, three international post-doctoral specialties (i.e. Oncology and drug discovery; Dermato-oncology and stem cells research; Hematology and genomics). Dr. Menaa assumed different positions as a Teacher, Principal Investigator, Executive Director, Consultant, Advisor, Editor, Reviewer, Event Organizer or Entrepreneur, and he was recently selected for “Who´s is Who in the World”. His mentors include world-renowned professionals such as Prof. Dr. Axel Kahn (MD, PhD – France), Prof. Dr. Juergen C. Becker (MD, PhD – Germany), and Prof. Dr. Fernando Ferreira Costa (MD, PhD – Brazil). Thereby, as a CFR and LNCC awarded investigator, he earned his doctorate of gerontology and oncology in 2003 with highest distinction from Sorbonne?university of Paris 7 & Nuclear Energy Authority/Ministry of Defence (Paris, France) after identifying new human genes involved in the radio-modulation of mammalian cancer cells while contributing with projects related to DNA repair systems. Then, as NIH fellow (2004-2007) in oncology and drug discovery, he pursued his career at Sidney Kimmel Cancer Center\Sanford-Burnham Medical Research Institute (San Diego, California, USA) where he pioneered a paradigmatic DNA-damage signaling pathway while contributing to other projects associated with cell cycle and proteolysis systems. Subsequently, as a DFG fellow (2007-2009) in dermatology, dermato-immunology and dermato-oncology at the University of Wuerzburg (Wuerzburg, Bavaria, Germany), he discovered a crucial association between skin cancer stem cells, diagnosis and prognosis. Recently, as a FAPESP fellow (2010-2012) in hematology and genomics at the State University of Campinas (UNICAMP) (Campinas, São Paulo, Brazil), he pioneered the identification of new genomic variants of stroke in adult patients with sickle cell anemia. Further, Dr. Menaa is experienced with teaching and served for more than five years as editor and/or reviewer in a large number of esteemed journals worldwide (>80) such as: Physical Chemistry Chemical Physics (RSC), Organic and Biomolecular Chemistry (RSC), Current Medicinal Chemistry (Bentham Science), Current Organic Chemistry (Bentham Science), Current Drug Therapy (Bentham Science), Journal of Biomedicine and Biotechnology (Hindawi), International Journal of Nanomedicine (Dovepress), Journal of Regenerative Medicine (Sci Technol), Journal of Nanomaterials & Molecular Nanotechnology (Sci Technol), Journal of Biomaterials and Nanobiotechnology (Scirp), Journal of Nanomedicine and Biotherapeutics Discovery (OMICS), European Journal of Nutrition (Springer), Journal of Business & Financial Affairs (OMICS), Journal of Economics and International Business Management (Sciencewebpublishing). Dr. Menaa is/was also a member of several prestigious medical and scientific societies (e.g. AACR, ASCB, IRSCC, SPIE, RSC, ACS, ASH, ASHG, AAPS).Importantly, Dr. Menaa has the ability to develop national and international scientific collaborations with academic (> 10 worldwide universities), governmental (e.g. FDA, ANVISA, AFSSA/ANSESS) and industrial organizations (e.g. Fluorotronics Inc., California Innovation group, Inc; Exiquon, Pfizer, Novartis). Besides his academic achievements, Dr. Menaa has also a long-lasting experience (> 7 years with pharmaceutical, chemical, biotechnology and nanotechnology companies (e.g. Guerbet, HMR/Aventis, Fluorotronics) where he developed more than twenty R&D and business projects (e.g. stem cells, oncology, anti-aging medicine, nutrition and food technology, pharmaceutical sciences, biochemistry, microbiology, physico-chemistry); Many of them have been published. For instance, he was a consultant, director, coacher, head of laboratory/supervisor, business and scientific advisory boards member, chief scientific officer and R&D&I executive vice-president at Fluorotronics, Inc., San Diego, CA, USA, a nanotechnology and fluorine chemical company (2006-2012). Dr. Menaa is co-founding Bionanomics, an innovative biotechnology and pharmaceutical company at the interface of nanotechnology, nanomedicine and nanopharmacy. Dr. Menaa is also founding the multi- and inter-disciplinary alliance for the advancement of Medicine, Science and Technology, namely OHGGENIO (Oncology-Hematology-Gerontology-Genetics-Nanomedicine-Innovation). Dr. Menaa´s main current focuses are related to preventive, personalized, translational, integrative, green and nano-based medicine, especially in the areas of oncology, regenerative medicine and gerontology, in order to prevent, implement early diagnosis, and develop efficient and safer therapy. Dr. Menaa has authored more than 70 publications (including peer-reviewed ISI research and review articles, books, book chapters, conference proceedings, pending patents), mostly as first author and/or corresponding author. Several articles are also on the way to get (re-)submitted. Dr Menaa is getting highly cited (> 400 citations) and is the recipient of several awards (e.g. Scholarships, Fellowships). Moreover, Dr. Menaa was the leading organizer of the “Target Meeting´s 1st World Nanomedicine and Nanobiotechnology Online Conference” (http://www.targetmeeting.com; 2013), co-organizer of two “Nanomaterials Conference” (Beijing, China; 2013, Shenzhen, China; 2014), member of the technical committee of the “3rd ScienceOne Conference on Drug Discovery and Development” (Dubai, UAE; 2014). Dr. Menaa is regularly invited as a chairman and/or renowned speaker to reputed world congresses and organizations (> 100), where he is offering speeches in various areas of medicine, sciences and technology. He has participated to over 250 events related to Medecine, Sciences, Technology and Business Administration, and has produced >150 abstracts, some indexed in good impact factor journals (e.g. Tissue Engineering Part A; Current Medicinal Chemistry). During his spare time, Dr. Menaa enjoys family, arts, sports and travelling. Dr. Menaa´s main current focuses are related to preventive, personalized, translational, integrative, green and nano-based medicine, especially in the areas of oncology, regenerative medicine and gerontology, in order to prevent, implement early diagnosis, and develop efficient and safer therapy.